Hey! I hope you’re having a great weekend. 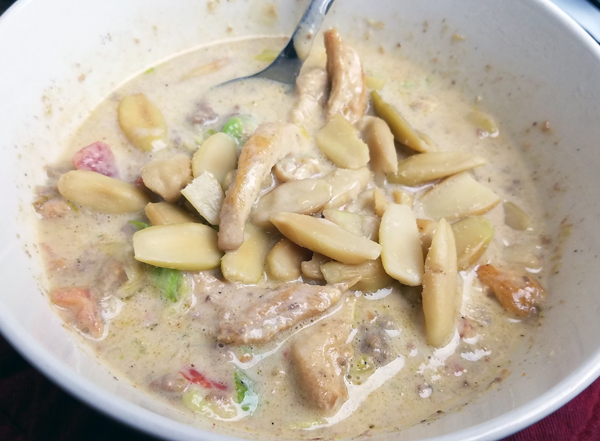 I thought I would check in and give you a photo tour of my low carb meals this week, plus my MyFitnessPal diaries so you can see how I log my foods. 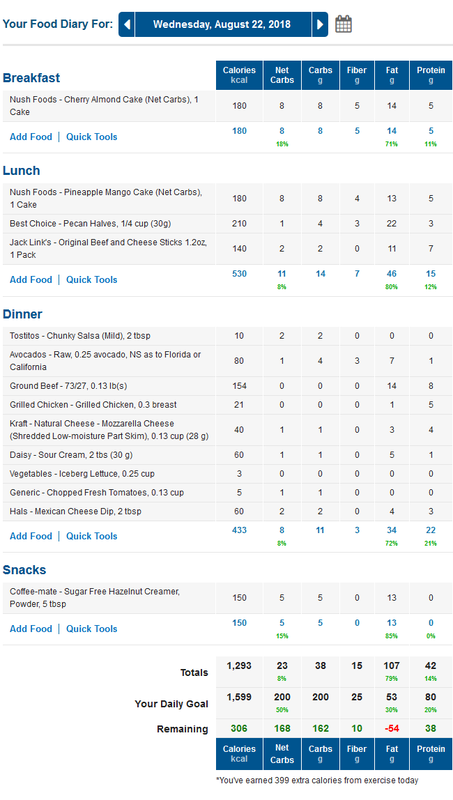 The keto food diaries below are for four full days: Monday, Tuesday, Wednesday and Thursday. I went hiking on Wednesday too, so I’ll have to tell you all about that in my next post. It was such a great hike! 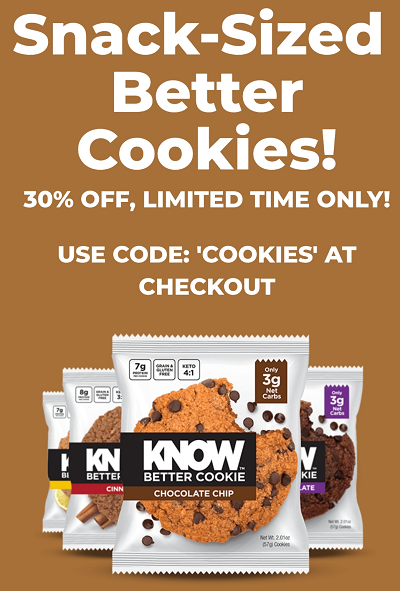 Remember the Know Foods low carb cookies? 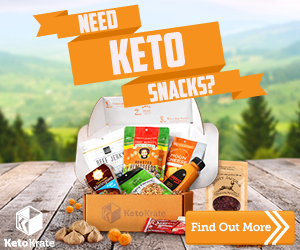 I haven’t got to try them yet, so if you have – let us know what you think! I love when they run specials! 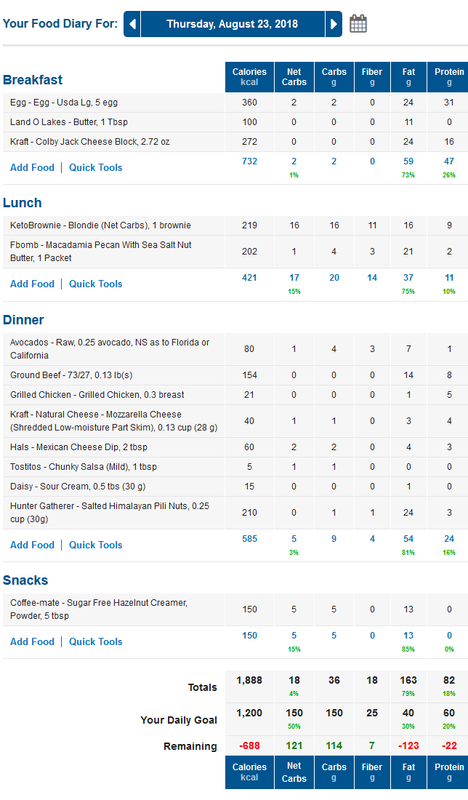 My MyFitnessPal diary (below) is logged backwards. I didn’t actually have breakfast on Monday, but rather an early lunch. 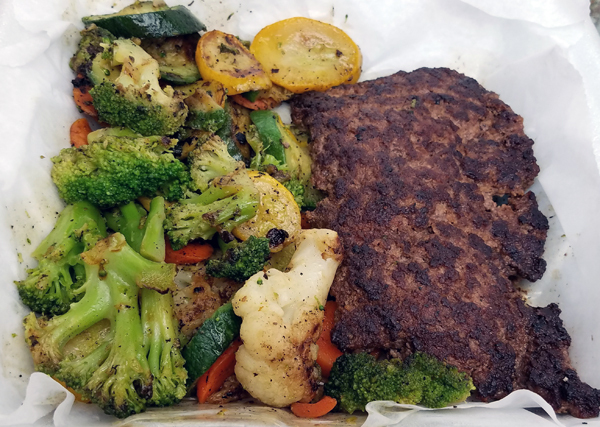 I ordered my favorite low carb delivery: a half pound hamburger steak with roasted veggies. I picked around the carrots of course. 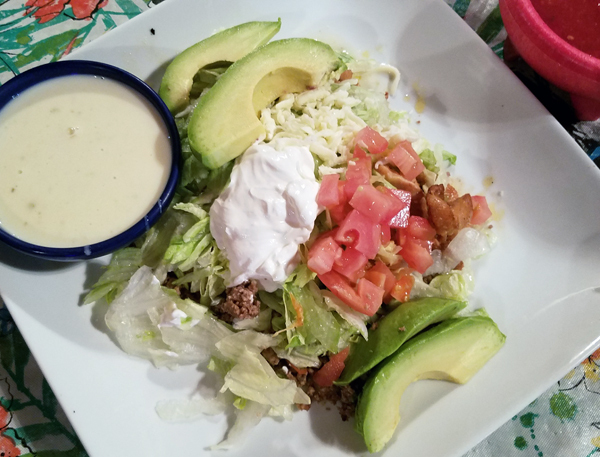 With a side salad of just romaine & mozzarella – and ranch for dipping. 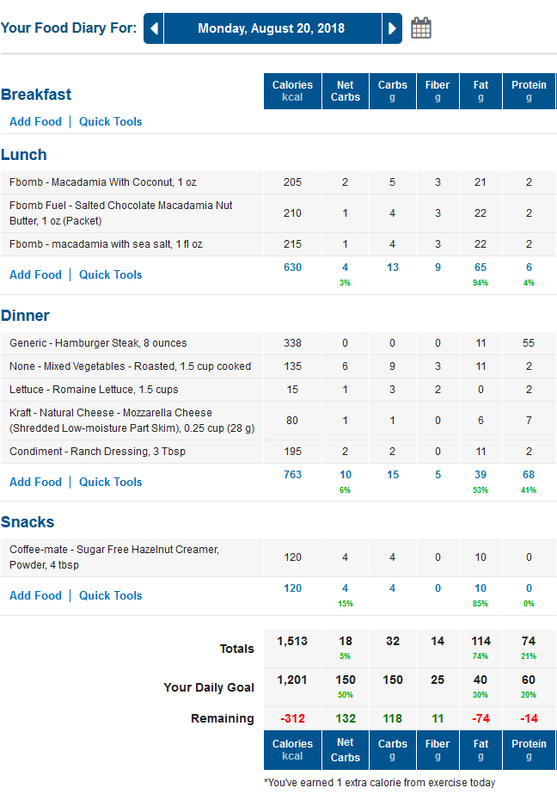 This actually made two meals for me, an early lunch and an early dinner. 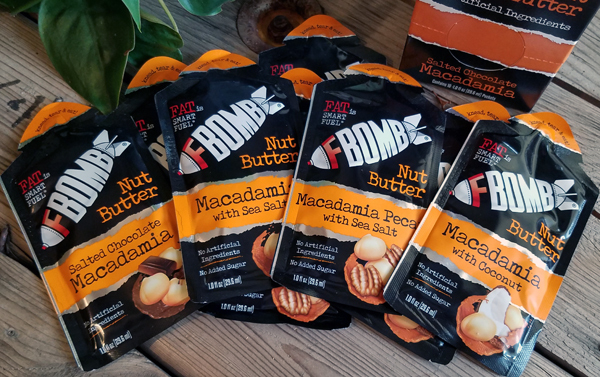 This affiliate link has the FBomb Discount coded into it for you already, so you’ll see 20% off at checkout on your first order by using that link. 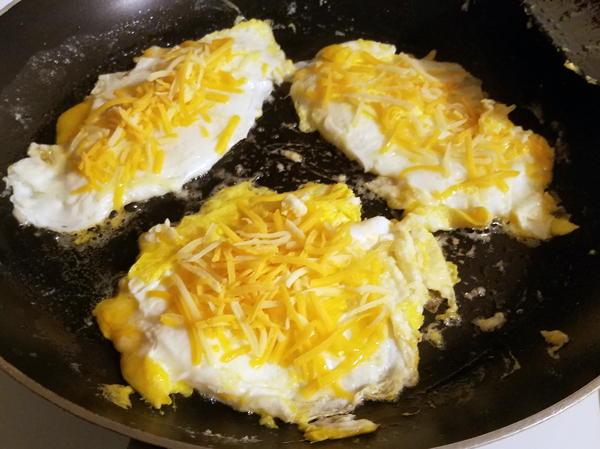 Breakfast on Tuesday was “cheese fried eggs” which simply means I fried eggs (in butter) and fried cheese on them – on both sides. I like fried cheese, and I like fried eggs, so this was a great combination! 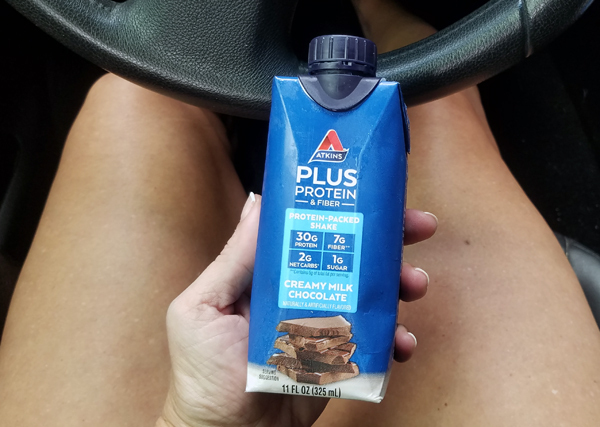 I had to run out later and was famished, and found this chocolate Atkins shake hiding in my fridge – so I grabbed that and drank it while I was running errands. 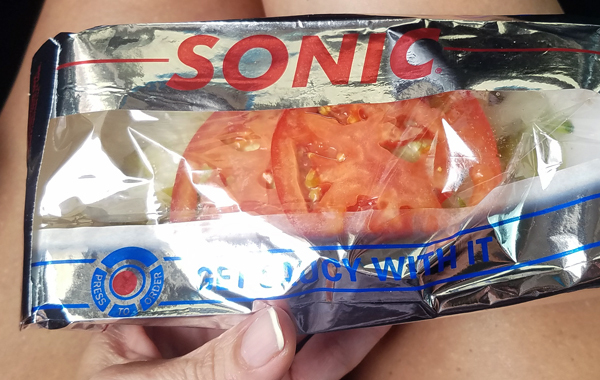 On my way back I stopped at Sonic Drive-In and ordered “a Double Sonic Cheeseburger with no bun please.” They put it in a coney box! 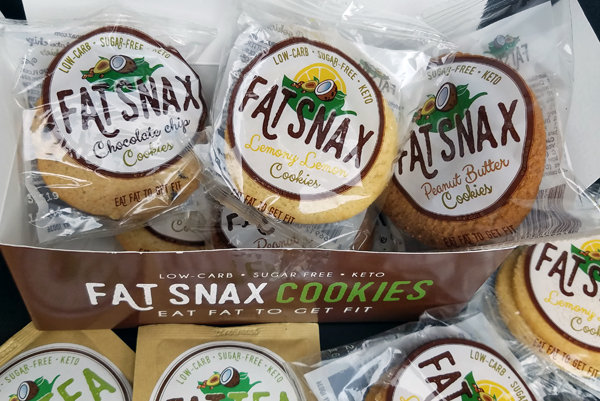 I had a pack of Peanut Butter FatSnax cookies while I was making breakfast, and another pack that evening – along with two of the FBomb nut butter packets. Cookies & coffee, fried eggs, Atkins shake, bunless burger, cookies & nut butter. Which would be considered 5 small meals – or two meals and snacking otherwise. 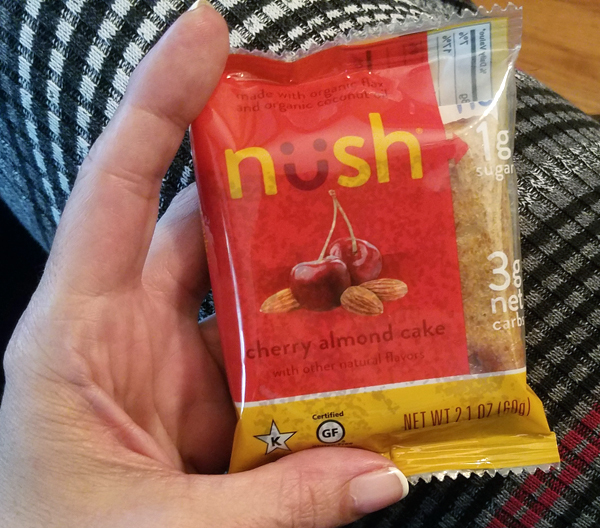 I got up on Wednesday and worked through the morning, grabbing a Nush Foods organic low carb cake to eat with my coffee at my desk. I was in a rush to wrap things up so I could get out for a hike! 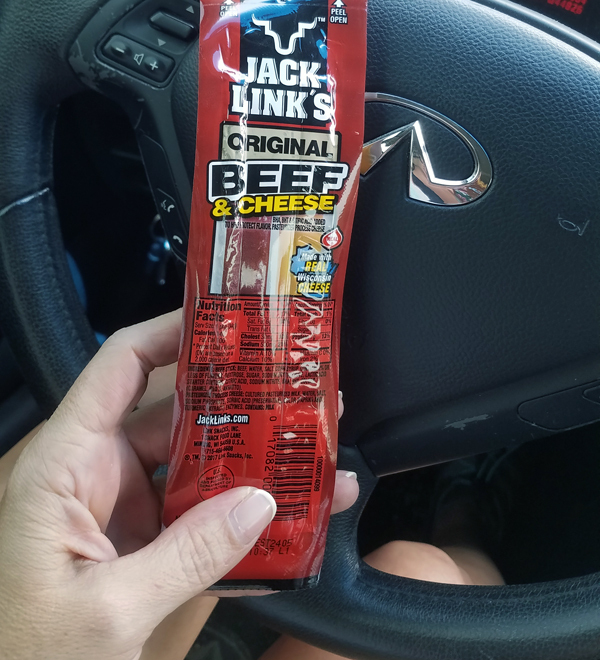 I stopped for gas on the way and picked up this beef & cheese stick snack. I have no idea why, because I already KNOW that I don’t like them, lol – yuck! I ate it anyway on my 90 minute drive to Ozone Falls. 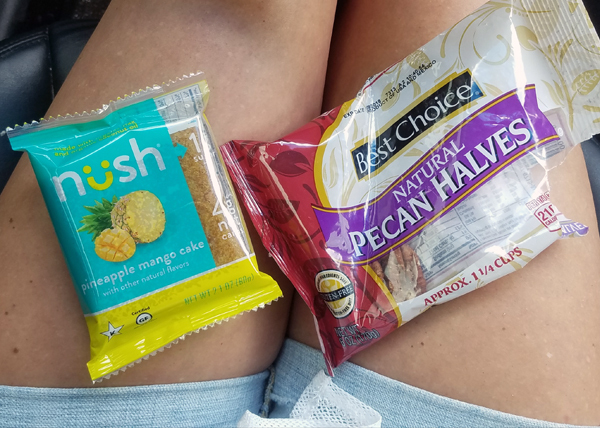 A few miles later and still hungry, I broke into my low carb snack stash and had some raw pecans and another NUSH Fods cake – this time Pineapple Mango! 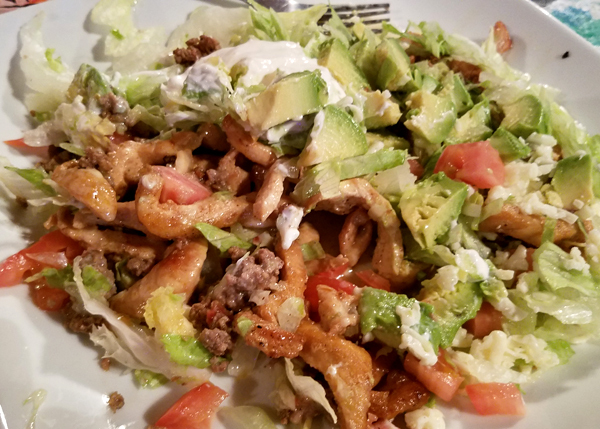 By the time I finally got dinner later that evening I was famished, so I stopped in at the local Mexican restaurant on my way home. I just prefer avocado to guac, plus I don’t have to worry about how it’s made or what’s in it. That was a delicious meal! I could only eat half of it, so I brought the other half home for leftovers. 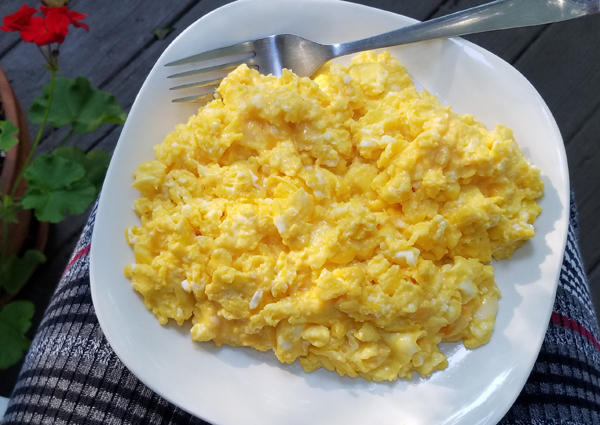 I got up and made enough cheesy eggs to last me two meals, because I had a busy work day. It’s FIVE eggs, and I can only eat maybe 3 at the most at a time. I finished the rest of my eggs for lunch, then for dinner I had my leftovers from the Mexican restaurant the night before. 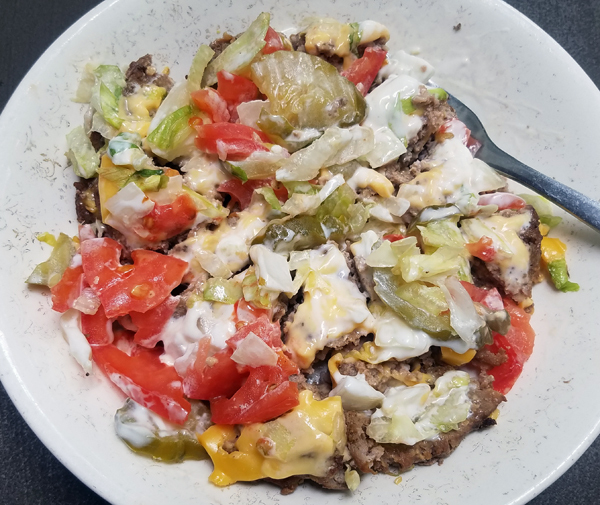 The salsa, sour cream & cheese dip turned into more of a “sauce” when I heated it up – which was yummy. Like taco salad soup! 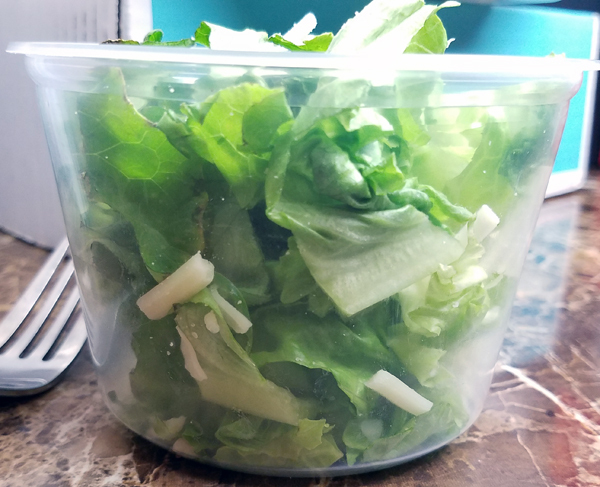 I pulled all the limp lettuce out of it and added a serving of Coconut Oil & Himalayan Salt Pili Nuts – for the soft buttery crunch, and to make it filling enough for a meal. 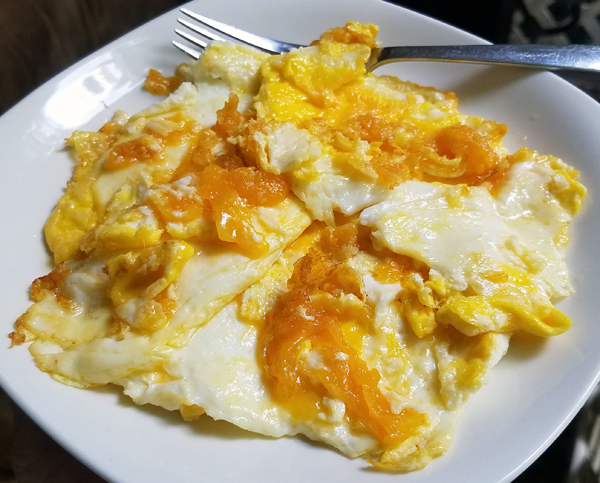 Yesterday I had my usual cheesy eggs and a few plain wings and a low carb beer – and tried something new from a low carb bakery that I’m still researching. 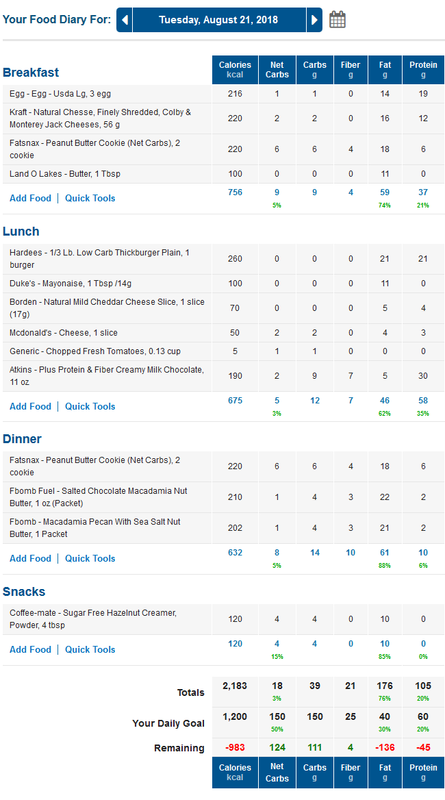 Just another typical day in my low carb life! Today I’m having roasted broccoli and cheesy eggs for dinner… just because that’s what I had on hand, lol. Weird combination I know, but it tastes great and it’s all real foods. Simple is good. My hike this week was GREAT and such a nice (much-needed) break! I’ll have to share the pictures and the story with you in my next post – including my very UNgraceful attempt at a backbend, and my creepy run-in with a man-eating jellyfish plant!